What do you feed your dogs and cats? Realistically, in today’s world. Dogs and cats are best fed as naturally as possible. And, by this I mean feeding them as close to what they have evolved to eat as possible. There is such a variety of pet foods available. As well as different feeding theories. And they all claim to be everything your pet will ever need. How does an ordinary pet owner like myself decide? To a very large extent, we can help this situation in our own pets’ lives, by changing the way we feed. Vets comment on how even a small change in the way we feed our animals can ‘cure’ a lot of diseases. Not many of us have hours spare in which to formulate and feed elaborate diets to our pets. What is the best we can do with limited time? You want to feed your dog or cat a good diet, but really don’t have time to do more than fill the bowl with kibble. If this is you, then buy the best kibble you can afford. In most cases, you get what you pay for. Do the best you can. Feed the best quality food that you can afford as a base. To this base, add broth, table scraps, oils, meat, eggs, vegetables, fruits. Keep it varied, keep it fresh, keep it natural and unprocessed. There is also the very excellent BARF diet (Biologically Appropriate Raw Foods) – raw natural food designed to mimic the evoutionary diet of a wild dog or cat. Add a good relevant supplement. 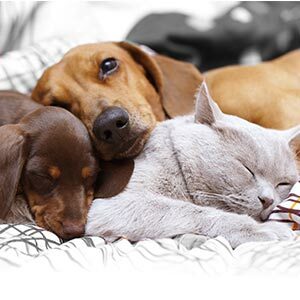 By changing to any of these three options, you are going to see a real difference in your pet’s health. Give it a try, then let me know your opinion. Since I have been in this business, I’ve found that the world can be divided into two categories – those who believe in natural medicine/feeding and those who don’t. I have problems with both of these categories. To the people who categorically disbelieve in anything natural, keep listening, I have some stories to tell you. To people who believe that natural medicine can do anything – including cure cancer, broken legs and rid the world of poverty – well, if that were true, I’d be a lot richer than I am. Nutrition and herbs can do wonderful things, but they too have their limitations. It is always best to consult a vet when your pet has a medical problem. Sometimes your vet might suggest a natural remedy as a first choice of treatment. If he doesn’t, please ask him why not. Sometimes, vets are very skeptical about natural remedies. Sometimes if the problem is too immediate or severe, conventional medicine might be the best way to go. I often get asked – why would my dog need a supplement if the pet foods are balanced? Also, if I supplement, would I be unbalancing the food? Or if my dog is on the BARF diet, or a home cooked diet, why would I need to supplement? If you believe the pet food companies, every single pet food on the market is 100% balanced. All your dog will ever need, etc. etc. The problem with this approach is that it is totally impossible to produce a generic feed specific to each individual dog. And the home cooked or raw diets are not perfect either – even meat and vegetables are not what they used to be in the ‘good old days’. Pollution, overfarming, import/export, mass production, prolonged storage, etc. have taken their toll. If the pet feeds were all perfect, we wouldn’t ever have problems with our pets. And we do see problems. Allergies are on the increase, arthritis is rife and nervous, anxious and aggressive dogs are very very common. You might say that these problems have nothing to do with nutrition. I beg to differ. We use small amounts of natural ingredients – herbs, vitamins, minerals – that work together to produce the desired effect. In this way, we minimize any side effects or problems that might occur with larger doses. When using minerals, I use the chelated form. This is a much more expensive raw material, but much safer. It is the form of mineral which is most easily absorbed. When using herbs, we use the whole plant. The modern trend in pharmaceuticals is to try to incorporate herbal medicine into the mainstream pharmaceutical industry. Which is a good thing, because it becomes more regulated and controlled. But the pharmaceutical industry has an unfortunate tendency to try to narrow the effect of herbs down to one molecule. And each plant consists of 1000s of molecules. So, for example they prefer Devil’s Claw to have a standardized amount of harpagoside in it. But harpagoside is only one constituent of the whole plant called Devils Claw. And by messing around with the plant in order to obtain an exact amount of harpagoside, some other, possibly active constituents of Devils Claw may be lost or compromised. That is why we prefer to use the whole, dried plant. We use human grade ingredients wherever we can. I am sure that most of you will agree with me – there is no reason why we should have two grades of food stuffs – human and animal. If something is not good enough for us, how can it possibly be good enough for our animals? It is always best to consult a vet when your pet has a medical problem. Sometimes your vet might suggest a natural remedy as a first choice of treatment.